Press free press present A TIME FOR WORK, a month-long durational activity. Within the space, they mark their non-space. This is their office. Two workers will operate under conditions of increased and decreased resistance, navigated by voices communicating from outside the city. They will attempt to map the exhibition through the means at their disposal: by writing, processing and editing a document that exists in constant flux. Each day of the exhibition a (writer) worker arrived to find an instruction on the office phone. They carried out the task requested, writing by hand, leaving the days production in the office out tray when they left, and taking a previous workers product home to be typed up. For now, the material/ writing has found form as on online PDF library that both preserves and (re-)creates the original installation, allowing a jpeg of the original installation to function as shelf and catalogue for a series of PDF files, one for each of 23 work shifts. Enter here. A TIME FOR WORK was a month long writing residency. press free press became a working company. Their place of work an office installed in the Pigeon Wing gallery (view images); two wooden boards constructed to make a cubicle, a paper floor, one chair, an inbox, an outbox, an overflow, a stack of paper, a company phone, a box of writing tools. This installation was designed to function as a working office; where the office employees came and went in accordance with their rota and the company was bound by a contract (read CONTRACT). 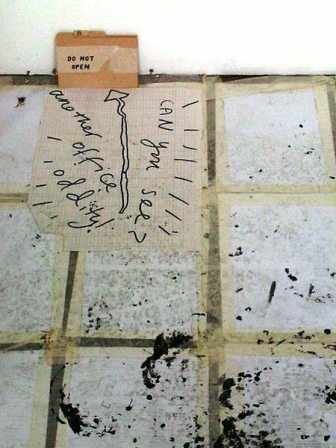 press free press functioned as a company investigating the action of writing in duration, writing as a performative action, writing to document a process, writing as publication, publishing as exhibition and performance. Note what shifts and expands between these two descriptions, perfunctory statements for press release and home page that also show the specific becoming general, description turning documentary and score, how language functions within the prosthetic body of the Press Free Press project. Perhaps other forms for the writing may be forthcoming, or perhaps this site offers closure. The momentums of texts interact with the practicalities of time and new projects that emerge, and it’s an act of anti-entropic generosity to oneself and others to present these writings as hard copy(able) texts versus exhibition as memory and image-myth. This repetition is out of time, it shifts and escapes itself to form interesting patterns. Patterns which fold onto each other, which refract and reflect and multiply to only crumble again. I like this. The body is alive with sounds that repeat, re-utter themselves and get re-defined. The possibility for change comes in the form of the word being the same but sounding different or sounding different and being the same. I remember B and R had different strategies for negotiating the visibility/ invisibility of their writing/shifts, saying hallo, chatting, or not, but always focussed on the work required rather than small talk; the office/writing as a space apart; how it was odd to realise that someone was there writing, to wonder if one was included in the sense of site the writer was unfolding, and how; to be equally surprised that the writer had suddenly, shift over, gone. The texts do not have to verify. I’ll stop there, as it seems wrong to be talking about A TIME FOR WORK as a project that happened then and there, when it also didn’t, and now it does and is and will be. In this PDF writing (work) finds an order, a uniformity (every shift 25 pages, not specified in the score) and an anonymity (who wrote edited typed up this one?) (One?). A construction of a shift, a vision of work, tight adherence to frame. Something happens in this commitment to materiality. We’re (We?) shifting letters/syllables, but there’s an emergent property that seems to demonstrate an ethics and utility, without leaving its constraints. Justify. Clarify. Text as word shape on the page. Text as sounded. A text could unfold for ever in the need to clarify the differences between these. That could be momentum -say -say -say -say. A clean writing, too, transparent about its starting point and structures, from which any content must come. Of harm. Risk and. Adding space between letters available tactic. 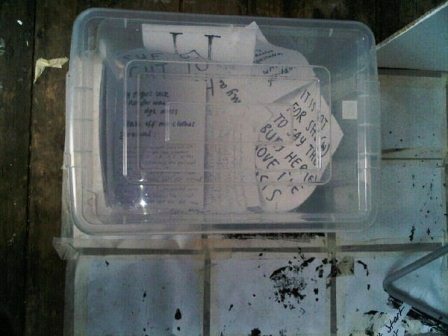 In the recollections above I forgot the A TIME FOR WORK office rubbish bin, of thrown away texts, that – paper pieces plucked out – could be inserted into new texts, days, writings, shifts. I also remember at the closing performance long windedly attempting to introduce the project, as its final performance unfolded on its own, fine by itself, its own claim and fiction, such attempts already absorbed into its structure and presentation. Looking through the A TIME FOR WORK website I propose: Don’t think of what you find here as products of a single place and time (The Pigeon Wing, September-October 2010). Writing was prompted by scores sent from elsewhere, nodes of a network of peoples/ times/ places before and after. Its handwritten notes were transcribed by other hands, keyboards, into other formats; as further editing suggestions and constraints have led to the form of the texts presented here. That stops. This continues.